There are many different types and brands of catheters available today, but there are typically only two basic insertion tip types (with the exception of some variations of the two): straight tip and coudé tip. Straight is the most common type of insertion tip, but coudé catheters are also frequently used. Read on to learn more about this type of catheter insertion tip to see if it is right for your needs. A coudé tip is basically a slightly angled or curved tip on a catheter. This type of tip is best for those who have difficulty passing a regular straight tip intermittent catheter. This situation is most common in men, so the coudé tip is almost always an option on male length catheters. The reasons for needing coudé tips may include a urethral stricture, blockage, an enlarged prostate, or false passages. Your doctor or other prescribing health care professional can determine what will work best for you, based on your anatomy as well as the underlying issue causing the need for a coudé. Coudé catheters come in a variety of options for your individual needs and preferences, such as closed system kits, hydrophilic catheters, and intermittent straight catheters. See our online product catalog for a look at some of the available options and their features. This type of coudé catheter tip (pictured above) features a short, strong curve that is smaller at the insertion point. This is especially good for navigating through strictures or bypassing enlarged prostates. This tip is slightly ball-shaped and rounded with a curve to aid in smooth passage around obstructions to the bladder. The olive tip coudé catheter may be a good option for getting past false passages that a standard tapered or Tiemann tip might catch on. The Tiemann tip is elongated and tapered, and it’s also typically more pliable than other coudé tips. It’s helpful for navigating narrower passages and bypassing strictures, and the pliability of the tip can aid in better comfort during catheterization. Everyone’s anatomy is different, so the way to insert the curved tip of your coudé catheter will depend on your doctor’s medical opinion and instructions. Your urologist or urology nurse will likely spend some time with you during your appointment to go over the process of learning how to insert a catheter, including which direction to face the angle of the insertion tip. Many coudé tip catheters will offer a reference point on the funnel, such as a notch or a bump to indicate the angle. Others have a guiding line down the catheter tube as well. After you leave your doctor’s office and start using intermittent catheters on your own, it’s natural that you might still have some questions or need further assistance. 180 Medical can help! 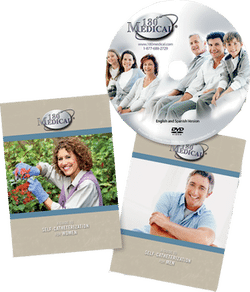 We have trained specialists available during our business hours, and we offer one-of-a-kind informational booklets and DVDs about catheterization. We’ll do all we can to make this process easy for you. For help learning how to use a coudé tip catheter, take a look at our online instructions, including a helpful video just for those using a coudé tip catheter, even if you are in a wheelchair or have limited hand dexterity. 180 Medical offers a variety of quality coudé catheter options, such as regular straight catheters with separate lubrication jelly, hydrophilic or pre-lubricated catheters, and closed system catheters. There is no one catheter that works best for everyone. With 180 Medical, you’ll have access to the widest selection of the top coudé tip catheters, available from the best manufacturers on the market today, including ConvaTec’s GentleCath, Bard, Coloplast, Cure, Hollister, Rusch, LoFric, and more! Contact us today to speak with one of our friendly, trained catheter specialists to get started on the road to finding the best catheter for your needs. Have you recently been told you need to use coudé catheters and need some more information? Find out more about the coudé insertion tip in our latest blog.